U2 kicked off the home leg of their world tour in style as 80,000 fans from all over the world landed in Dublin for an unforgettable night. The atmosphere was electric as one of the world's greatest rock bands arrived back in Croke Park last night and belted out their first track Breathe. There were more huge cheers when Bono launched in to Magnificent while walking across a moving bridge before he performed Beautiful Day. "In the words of our good friends the Corrs, we are so young," he shouted, at the start of Beautiful Day. "As a nation I mean," he added pointing to the crowd. U2 had promised fans a night and a stage show to remember and they were not going to let anyone down. Once they performed tracks from their latest album, the band launched into their greatest hits. Bono also paid tribute to Ronnie Drew of the Dubliners, who died last year, by playing the Auld Triangle. U2 dazzled fans from inside a giant steel claw that rose to 60 metres high above the crown, almost as tall as the stands surrounding it. It took a week to construct the impressive setting, which included 550 tonnes of steel, 56 tonnes of video screens and spanned across a third of the pitch. Music aside, the band's political allegiance was clear - with a dedication to jailed Burmese politician Aung San Suu Kyi, currently on trial charged with breaking a draconian security law. Thousands of concert-goers wore a mask bearing her image when the band played Walk On. Fans queued from midnight on Thursday in torrential rain to catch the band up close. Over the coming days more than 240,000 revellers from as far as Japan, Canada and America will descend on the north Dublin stadium. It is estimated that the three gigs at GAA headquarters will boost Dublin's economy by €50m. 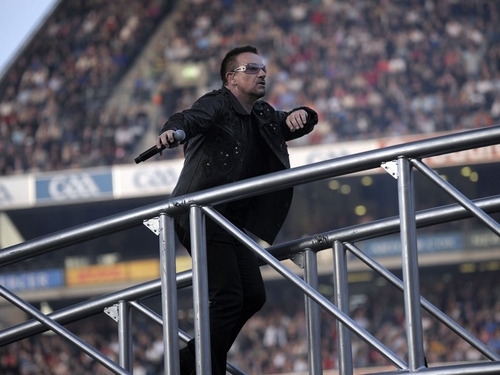 Before the gig Bono told fans via a website link-up: "The 'rehearsals' have been going really well. We've been rehearsing in Barcelona, Milan, Nice, Berlin and Amsterdam, but we expect that the main event in Dublin will be better than any of them."